Hands down the single finest Clemente RC we've brokered in our history. This card is truly awesome from every angle and shows all the eye appeal of a NM-MT+ card. Almost dead centered with stark white borders and a rich, glossy surface that simply doesn't present itself on even high grade examples very often. The corners are immaculate for the issue with several verging on MINT status. Perhaps best of all the print and color and virtually perfect to complete the all-around special eye appeal. 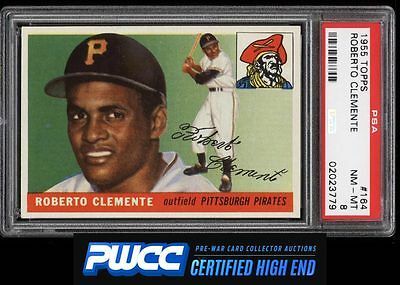 We love this card, not only because it's a high grade Clemente RC, but also because it may be one of the half-dozen finest PSA 8s in the entire hobby. As good as it gets and comes with our highest recommendation. One of nearly 17,000 cards, lots, and sets up for bid in our 8th Auction of 2016. Click on the link above to view the other PWCC auction lots.